Imagine you are in a room with bunk beds. Some people are lying in the bunk beds and others are lying on the floor, sleeping bags tucked up under their chin. A CD is playing. Toys, books and games are in messy piles waiting to be used. Instead, the occupants of the room are caterwauling their hearts away to "Santa Claus is coming to town!" Ever so often, Mam or Dad poke in their heads to ask "Are you kids ever going to sleep"? Fast forward to morning, and I am the first one awake. I wait as long as I can (usually 5 minutes) before deciding that my siblings have slept long enough and I start singing (off key as it's the only way I sing) Jingle Bells or some other tune. A lot of growling, pleas to shut up and threats to smother me later, we stand at the top of the stairs, blankets wrapped around us, socks pulled as high as they can go, waiting on our mother's signal. Down we creep, each of us grabbing our Christmas sock. We file into the front room and wait for our dad to return with the tea (good guy, Dad!). Jostling each other we fight for the best seats and then open our socks, spilling pens, sweets and goodies onto our laps. Christmas day has started. I love Christmas and everything connected to it - Christmas Eve Mass, the Nativity Scene, Christmas trees, lights and decorations, food, traditions and gifts. 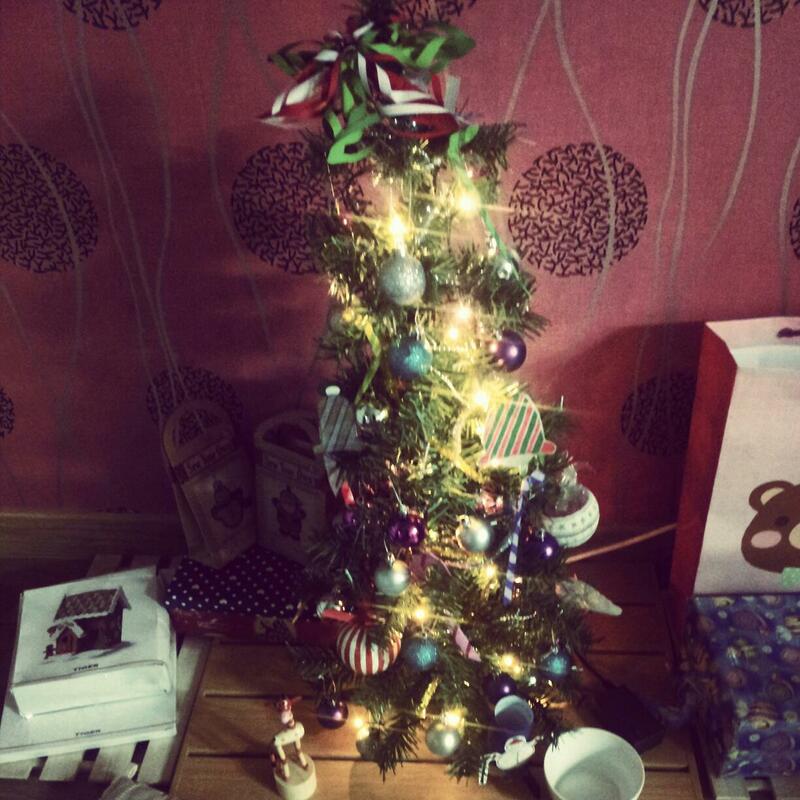 Coming to Korea, I knew that I wouldn't get to celebrate Christmas the way that I had in the past. While there were some traditions I wanted to keep (Kris Kindle with my family), there were some I had to forgo (my Mam's Christmas cake) and some I got to start. Some of these traditions I've decided to not only continue in Korea but for the rest of my life. What better way to keep a piece of my family and Korea with me always than by sharing with my own (hopefully, someday!) family. Christmas is different in Korea - it's harder to get the turkey... and the spiced beef isn't happening....but you can still have the sides: mashed potatoes, garlic potatoes, roast potatoes, fried potatoes (did I mention potatoes? ), green bean casserole, roasted veg and even pumpkin pie. It just takes being a little more creative. 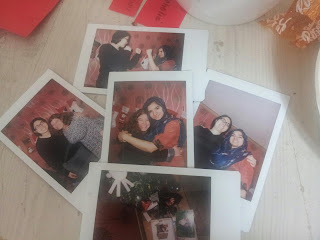 Last year, Christmas morning was spent having brunch with some close friends and their siblings. It was a lot of fun as everyone contributed yummies from crepes to chocolates! The evening was spent having a Christmas dinner where again wonderful food and company was provided. Now there are way more people in Jochiwon than last year, which means meeting in one person's house is really difficult. On Christmas Eve, a bunch of us are going to meet to exchange Kris Kindle gifts and on Christmas night I've invited the community to come to my house, if they want, for some drinks and maybe dessert. 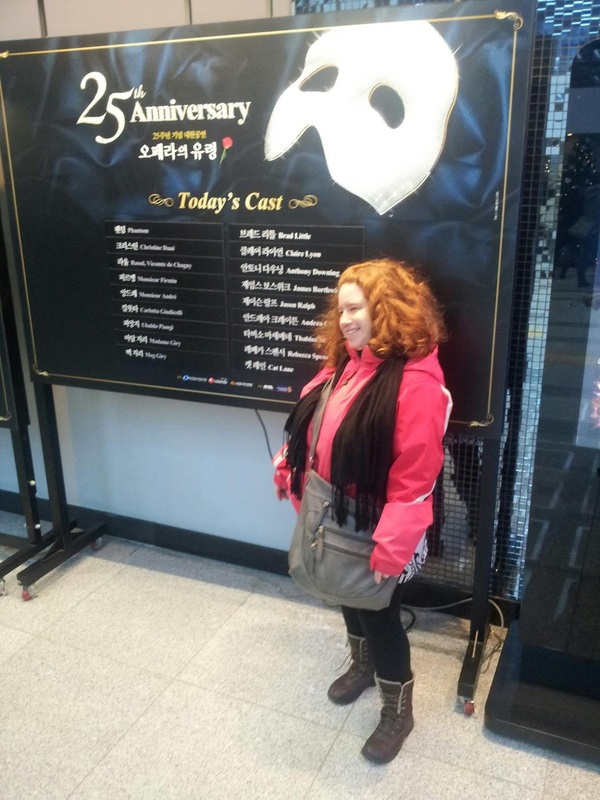 Being with your family is probably impossible as an expat in Korea, unless someone visits you or you are lucky enough to get the Christmas week off to go home (on both counts, I am the queen of envy!). However, you can still spend it with people you love. Spend it with your friends and Skype with your family. That's what I did last year and what I am doing this year. My house isn't big enough to fit people sitting comfortably (last year at least 3-4 people had to stand to eat!) and as mentioned already we have a lot of people this year. Both this year and last year, I spent the majority of the day with my close friends and then the evening with my all my other friends. I know I wasn't the only one then and I won't be the only one doing it this year. My brother and his friends travelled distances to be together as their "family" his Christmas here. I've already talked about how I have made decorations for Christmas and I mentioned the advent calendar. This is my new favourite tradition. A lot of times, I find it hard to balance my excitement with what the season is really about. When this happens I can become a bit snarky (Christmas 2011, anyone?). I don't like this side of me, so in an effort to combat it and so I don't feel "let-down" by Christmas I came up with my advent calendar. This calendar allows me to put up one decoration a day from the 1st to the 25th December starting with the Christmas tree and lights all the way down to the baba Jesus in the crib. Every day, I get to put up one decoration (Santa decoration) or several types of one decoration (baubles). There are days where in order to put up the decoration, I must make something (snowmen and snowflakes). I have found that doing this has helped me to keep my Christmas spirit intact all the way through Christmas Day and even into the New Year. I've been quite busy this December so some things I am leaving to make on my birthday and even maybe the next crafts club in February (it's a sewing project, so it's allowed! ).Another tradition that I have decided to start is making my own Christmas inspired foods and drinks: Non-alcoholic apple cider and mulled wine (my sister is going to send me the recipe..hint-hint), peanut butter cups (thanks, Jaime), mincemeat, and my own version of the Chocolate Refrigerator cake (original recipe is here). Some other things that have helped me was to enjoy Christmas in Korea are as follows, and who knows maybe they will help you too! Listening to Christmas FM. This is is a charity radio station from Ireland and every year their charity partner changes. They play lots of Christmas songs and it's always nice to hear the Irish accent! Don't sit alone at home. This is key. Sitting alone at home induces wallowing and the cry of "Why me?" Go for coffee, meet for dinner - just get away from yourself for a few hours. Go to something Christmassy. 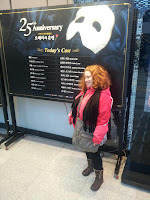 Last year, I saw The Hobbit and I went to a performance of The Phantom of the Opera. I have yet to make it to the second Hobbit movie but I did go see The Nutcracker. Decorate your home. Even if it's just to put some fairy lights up - it puts you in good spirit, add in that music and sure you'll be laughing in no time at all! The more creative you are the better - I like making Christmas decoration and will happily spend hours cutting out snowflakes but you could also do what my friend, Rucy, did and make a Tripod tree. Do something charitable, even if you can't make it to an actual place to volunteer, give some cash to the Salvation army or if you know someone who is involved in a charity, perhaps you can donate. This year, one of the girls in my town is organising gifts for the local orphanage. Another girl is organising a wrapping party for these gifts. Fun shall ensue! With your close friends share a part of your childhood Christmases. Santa always brought stationery to us and I am passing that useful tradition on to my friends. Delicious roast potatoes will be my other reminder of home this year as is the tea, games and chats. At home, my family doesn't turn on the TV for the few days surrounding Christmas. Instead we partake in each others company. So in my house (while the computer will play music), no TV is the rule on Christmas day! "Merry Christmas to all and to all a good night". So you might think I'm mad to try and start traditions in Korea that I think I want to do for the rest of my life. You might think I'm mad to try and recreate as much as I can the Christmases I had as a child. Christmas is about magic and if you believe hard enough, then much like Tinkerbell, Christmas is alive and well. As my very wise mother once told me when I was being a bit of a brat, Christmas is what you make it - if you only let yourself get caught up in the commercialism of it you will be let down. So even if you are far from home and far from loved ones, keep your Christmas spirit and just maybe you'll find that the "love ones [don't need to be] near" for it to be "the most wonderful time of the year." PS. This post is inspired by the song "It's the most wonderful time of the year" and trying to make Christmas in Korea the most wonderful time of the year.